This is an Alti+ update, it has come a long way since my last post. Alti+ supports all normal maps. These maps can be run exactly as they were designed, or you can tweak them a little by changing scales, allowed weapons, or other features. Additionally, for Coop maps, the server can force players to the correct side on a per-map basis. For more information on the server, please visit: https://github.com/biell/alti-server . This site contains an INSTALL.txt file to help you setup your own Alti+ server, and a FAQ.md file to help answer questions about creating Alti+ maps. If you would like to create an Alti+ map (and I would love it if you would) this file is a good place to start. I will be happy to work with anyone on making new maps and trouble shooting any issue which arise. Also, it is really easy to run your own alti+server instance, I am happy to help with that as well. After it is up, it is really easy to install the standard maps I have listed below. Races: You score goals for crossing checkpoints, the first team to cross them all (in-order) wins the race. This can be pure flying skill with weapons disabled, or more like Mario Kart with weapons enabled. Race maps are not only won, but the winning time is stored in the record books along with the winning racers nickname. Having a leader board to aspire to makes the game more compelling, I think. Flag: You score a goal each time you capture the opposing team's flag. This game type plays a lot like TBD. But, without having to wait for a bomb, I am hoping it is a little more intense. This should make the game more enjoyable for defensive players, as attacks on the flag will come more often, and there will be no bomb carrier indication to snap them into attention. I think this mode will allow for smaller maps than TBD, but time will tell. All human players respawn after a flag is captured (I can't force bots to respawn). Ruin: This was originally called "Raze", but Alti is hard enough on non-native english speakers without me using words they probably haven't seen before. Additionally, it looked a little too much like "race". In this game type, you have to destroy all enemy structures (not just a base). The structures could be bases (multiple or just one) or turrets, or a combination of both. My alti+server counts counts all the structures defined in the map, and scores a goal every time 1/6th (assuming your server is configured for the default of 6 goals wins; it reads this value from the server config, so whatever your value is, it will work) of the structures are destroyed. Additionally, as you get close to finishing, it gives you a count-down. This type has two variants. If you also set "assignTeam", then it acts more like Coop, where all players are assigned to one team. If a player dies (crashing or killed by bot), then the opposing team gets a point. So, it is a little like Coop, but you can loose. In fact, with bots set to the highest level, it is easier to loose than you would think. If "assignTeam" isn't set, then each team in this varient must destroy all structures before the opposing team in order to win. MDG: This stands for "Most Dangerous Game", it is for asymmetric game play. Here, all but one player is assigned to one team. You can "/vote prey <nick>" if everyone agrees who that should be. This Mode is designed for those really great players (we all know who they are, and I'm not one of them) which can stand up to a team of 6 players by themselves. This game type works with TDM and 1DM. I personally think 1DM is the most compelling, but it still needs a little work with respect to rounds. If the server was set to single round 1-life play, it would work great. I have examples of these map type, and the next few posts will illustrate them. These maps can all be found on the "Team+" server, and my testing server "Map QA". This is my first "Capture the Flag" map. If this game type is best modeled after TDM, then this should be a good example. I think it has some design flaws that I am having trouble reconciling, but I would like to see how they affect game play before re-designing the map too many more times. There is nothing really special about this map. So, if it is way off base, I won't have a problem throwing it out. A capture the flag map without powerups, as these seem to tilt the power too much to offence in flag game types. A capture the flag map with some twists. I was originally going for a snooker table feel, but that went awry. In this one, players have to make calculated decisions about killing turrets. I created this game type to make a request by Sledgy come to life, an old game he liked called "Sopwith". This map is a re-creation of that game. The Objective is to destroy the area infrastructure. If you die, then the computer gets a point. Finish the destruction without dying 6 times, and you win. This map is a simple example of the "ruin" game type. I will be working on others when I have time. When area control came to my mind, the center of core seemed like the best place to start. 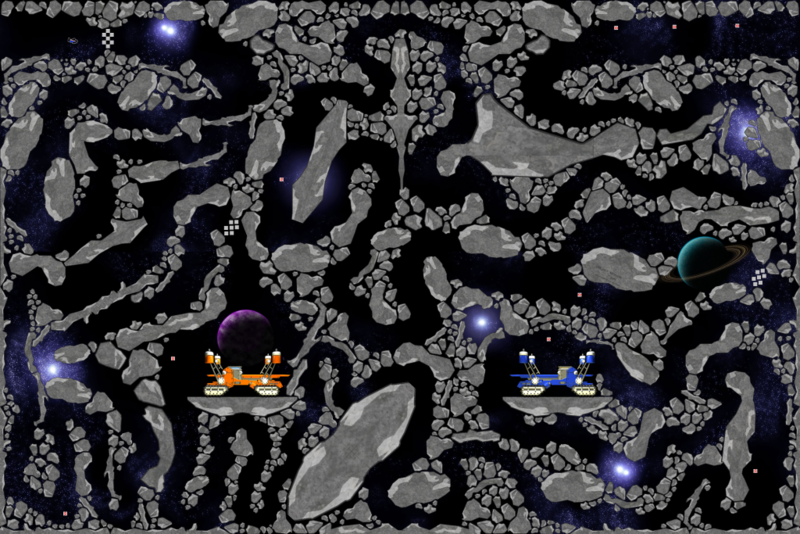 This map is designed so the prey has a private area to spawn and powerup, but the battle should take place in the core. This is asymetric game play. Any bots on the prey's team will be quickly dispatched, and it will continue as a many vs. one match. I have not completely worked out what would be best for these types of maps. If asymetric game play were to take off, I would probably create a new server just for these types of games. On that server, games would be limited to one single round. If done this way, the map would work perfectly. I would be interested in the communities opinion of this type of map. My expectation is that it would be a novelty only. But, I am not one of those players good enough to be by myself. Those players may yearning for this type of challenge. If race maps are ever to take off, I feel like this is the instant classic race map. It is long (~5 minutes to complete 2 laps) and the most difficult of all my race maps. This map is my illustration of using periodic beacons to map out the race. I couldn't really find any beacons I liked, so I used part of the TDM base to make my own. The key to making this kind of map is to get the spacing correct. 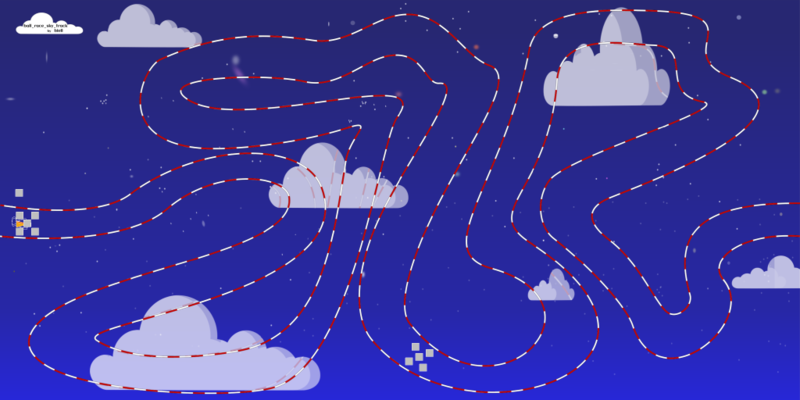 After spending a long time doing this by hand, I realized the best way would be to map the course out using a bezier tool and setting the line type to be periodic dots. Then, you could use the dots to space out the beacons, and delete the guide line after. This map was an example of just how easy it can be to create a simple race map. 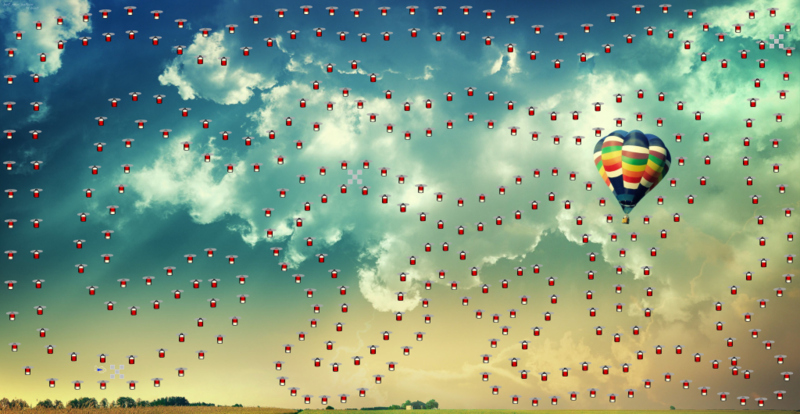 I found a few free clip-art clouds, and was able to put a race map together in a little over an hour. 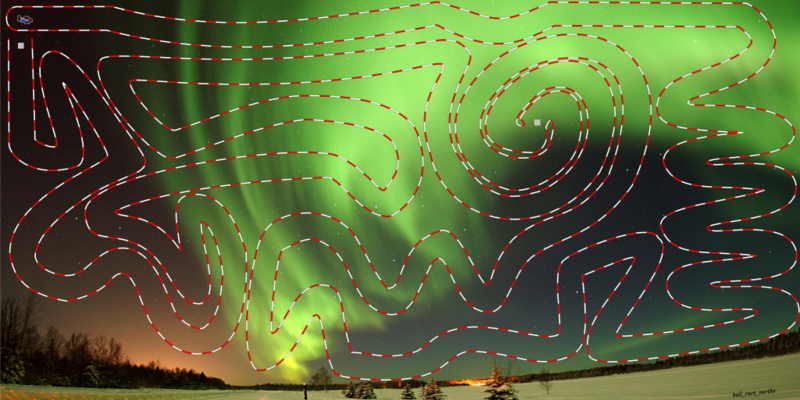 It is also an illustration of a race map which repeats in one direction. This is my attempt at making a weapons-hot style map. 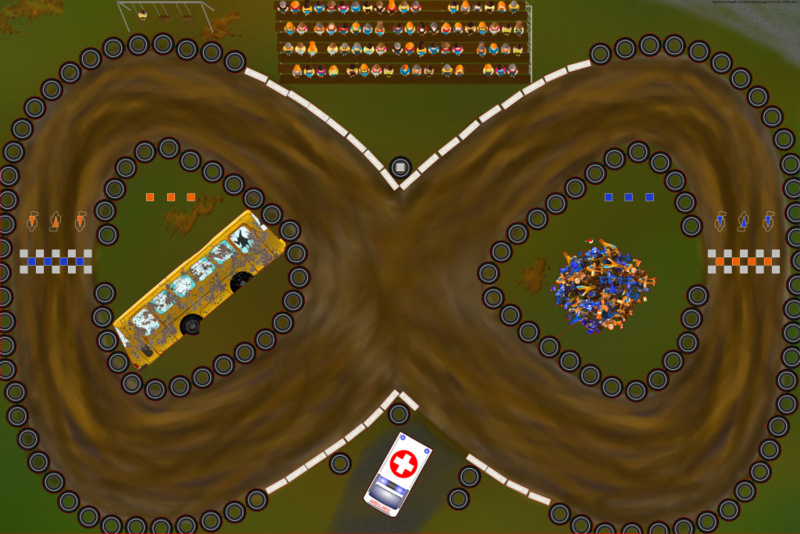 In this map, you need to cross checkpoints on a figure 8, dirt track. It is my expectation that some players would act as runners, and others as defenders. The defenders would try to stop (or at least slow down) the progression of the opposing team. There should be strategy involved in proper play of this map. Try not to get added to the heap of beat-up old planes, as you make your way around. Unlike most race maps, this one spawns you are the most recent checkpoint, and not where you died. I think it would take some time for a strategy to be devloped on how to play maps like this the best way, and I would like to have more maps like this if it becomes a hit. This map is proof that, while tedious, I can stare at a map of a real (or in this case proposed) circuit and replicate it with reasonable detail in inkscape. 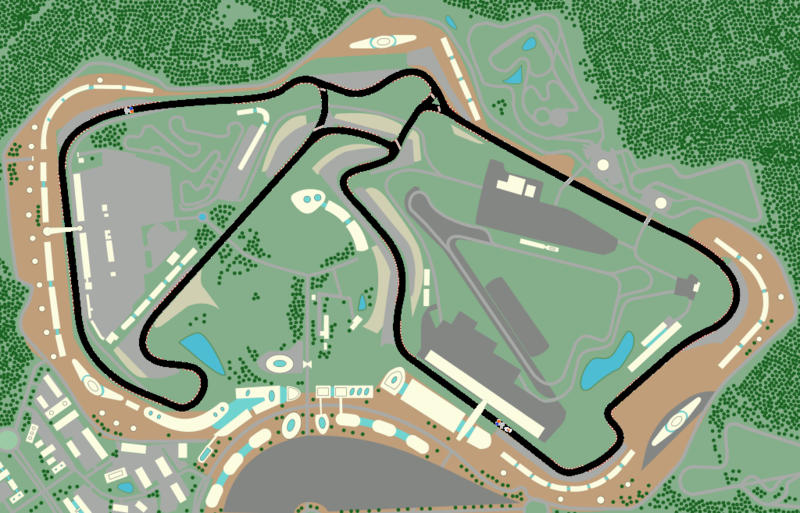 This map only races the longest possible circuit, but could be copied and each proposed circuit (grand prix, etc.) could be implemented with ease. This map was also my second attempt at a mini-map, and it works really, really well. The mini-map isn't visible on the screenshot, but it is worth playing the map once just to see it in action. This is my first race map, and it has a mini-map. This is a 2-lap race and was used to test and refine my race code. 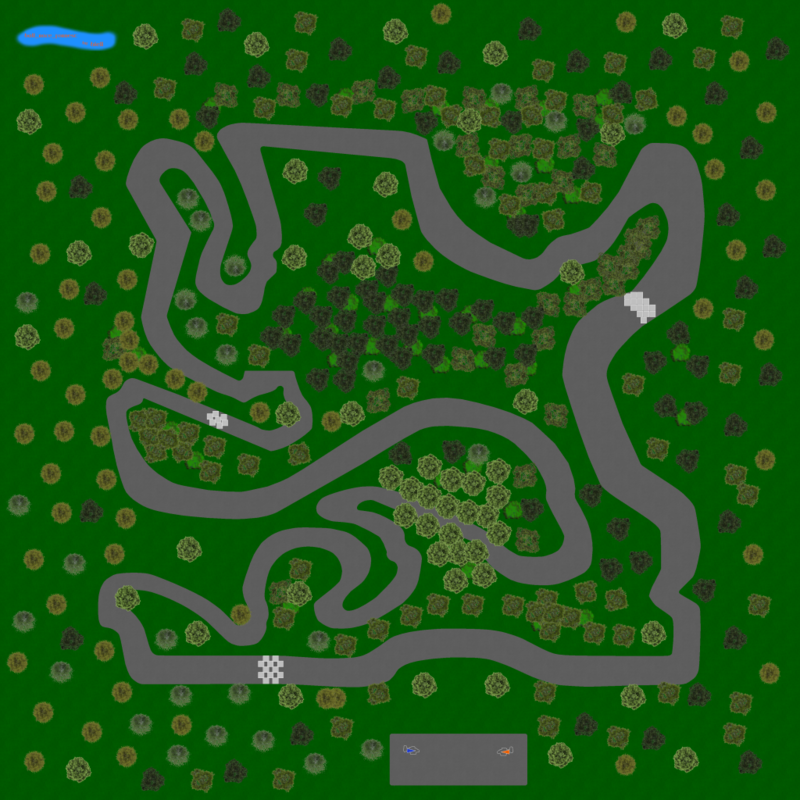 One additional feature on this map is an example of how to seperate bots from the race track. Both bots and late comers to the race will spawn below the race track. Human payers can elect to join the race by typing "/sz start". If you are designing a race map, and the bots are messing up your checkpoints, you can copy this technique. 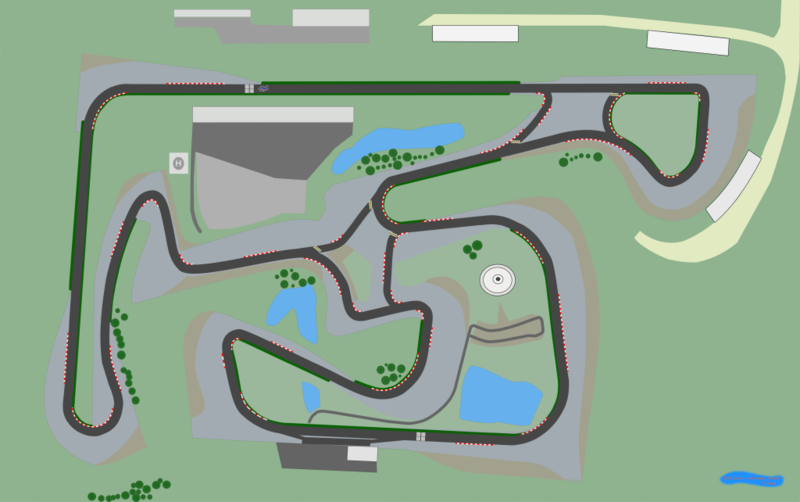 This is my first attempt at taking an existing, well known map and turning it into a race map. The key to doing this well is to try and keep the spirit of the original. In Mayhem, I think the top rounded alleys and ability to wrap around are key features of the maps. So, I built this race map around those concepts. This map is my illustration of what an A to B race can look like. Here, here is only one checkpoint (the finish line). So, I made it the ball. Normally you want to make checkpoints health to ensure players auto-use them and don't accidentally hang on to the (disabling them from picking up future checkpoints). So, here I start the score at 5-5, one goal (getting to the ball first) wins. This map is my example of how easy it can be to make a map with a Bezier tool. Using the methods on this track, I can easilly make a new race map in less than 2 hours. It is simple, but also a good way to test an idea for a track. This map is modeled after the Silverstone circuit in the UK. It was made by request. Orange and Blue tracks earning a goal for each lap. ball for completing the race. Besides the race, there is an easter egg. Capture the Flag: We played this 5v5 and it definitely has potential. As you only have to capture it though (and not bring it back to your own flag), attacking is a little bit too easy, especially with all the powerups that spawn every time. All I had to do was play randa, pick up a shield and rush to the flag. This mode can work but defense needs to get a big buff here, for example less powerups for attackers, less ways to get the flag (a whale can't defend if there are 6 ways to get to the flag and all the attacker has to do is touch the flag to win), bigger map, better turrets and probably a bit more open as it was very easy to not get hit. Ruin: We played the coop variant and it is pretty much impossible if you have newer players in the server. They spawn and die, which makes it rather boring Oh and for some reason we did get the record twice while we didn't manage to win once. Maybe work with deaths per individual (1-2) and not per team if that's possible? Races: Great fun and the leaderboards add a nice edge. Maybe in the future it would be cool to have whale only (with some narrow parts) or randa only (with walls randas can warp through or a narrow part like coop_randa_training) races for a bit more variety. Basketball: I'm assuming this is your map too? Enjoyable game mode but rather short, more goals to win would be nice! What could also be cool is if primary fire is disabled as well and you'd have to pass or shoot within a couple seconds or you die (get specced). Oh and maybe put the ceiling higher for a little more challenge. MDG: Haven't played this one but looks great! Overall great work and great new modes! And the minimap is sick! Thank you for the great feedback. I uploaded a new version of ball_flag_anxious. It isn't perfect, but I think it is better. It addresses a lot of your concerns. I wanted to try keeping the powerups in the middle, so I set them to spawn less often, and also to fade. If this still doesn't work, I will remove them. If it still needs tweaking, I think I will also try to increase wall damage. I think on the next map, I will make it bigger, and make the rush lanes longer, to give defenders a chance. I have bots set to expert on Team+, and without obsticles it is very hard. My test server has bots set lower, and it is much more playable. I wanted to put this map on my Coop+ server, but it doesn't have bots, so it isn't as fun. It is very playable on my test server (Map QA) which has bots set lower. I think I found the bug which caused your score to end up on the leader board, it appeared to happen when the bots scored more than 6 points (2 deaths at the end of match). I changed my "==$goals" to ">=$goals", and that should fix it. Making race maps with plane specific skill, like randa warping, is a good idea. It is something I have been thinking about for a while. Also, possibly forcing all players to one team, and requring whale w/ remote somehow. Basketball isn't mine. I set it to 1 goal to win, because I was playing it one day and it took 5 minutes for someone to sink a shot. I figured it would be more fun if it was over quicker. I think the Ruin concept has loads of potential. Based on your description, it sounds like a competitive version is anticipated. I REALLY like the concept of 'bombing' (with any weapon) the enemy city - with both civilian and military objects. And of course, with an air force willing to defend their territory and attack yours. Some WW2 themes come to mind with a BIP/Domber only, secondary fire only setup. I've only played the one vs. the 2 bots (looks like the only one posted here, too), which like you said is highly dependent on the skill level of the bots (and players). Do I need to do anything special to give this a shot, like download some file to add this type of game mode to my editor? I looked in the Git Repo but couldn't find the 'plus.txt' file. Sorry if this is obvious - I've only made 1 map thus far, and it was just a mod of an official map. Thanks and great work! /set intro Defend your city - and destroy the enemy's! Is that right? Is the game mode then determined by the first 2 elements of the map name (tbd_ruin_...)? Last edited by Solikos; 12-24-2015 at 10:22 PM. The plus.txt file is inside the .altx file, you need biell's tool to access it. I read that (and the FAQs, and skimmed the Install file but found no reference to 'Tool'). I guess I'm just lost as to how I'm supposed to use the tool file. Do I need to setup a server just to create maps that will be used on a Alti+ server? Do I just add this file to some directory the editor knows about? Is this a command-line tool? Sorry, my technical ignorance shines on! I don't know how to use the tool either XD I just upload the map onto Map QA then set the settings there. biell, my Altitude froze twice today, playing on Map QA. I had to restart my computer, I was wondering if this was just a coincidence. Last edited by Mango777; 12-25-2015 at 12:51 AM. Reason: Are you there biell? Mango is correct, the altx-tool is optional and can be found on the alti+server github page. It is designed to run on UNIX-like system with perl and the "xz" compression utilities (needed for LZMA) available. Linux works, OSX may also. I can look and see if I can get it to work on Windows, but I don't actually have access to a windows system. So, that is what makes it hard. If you can get it to work, then I will be happy to accept a pull request on github. Once you work out the map and settings on Map QA, let me know. I will upload the map and apply the settings to the Team+ server. Mango, I don't think anyting on my server can affect your client. My code interacts with the server via the command.txt file, and you only interact with the Nimbly code. That being said, the advanced settings (zoom, weapons, gravity, ...) are new features with "test" in their names. So, it is possible there are bugs with respect to these features. I re-worked ball_race_balloon. I had originally wanted players to be able to fly outside of the beacons, but only when it wasn't advantagous. This ended up causing players to get stuck. So, I have now changed the inner hull to touch every beacon, so you can no longer get stuck. I also made the hulls visible, with an alpha of 0. So, if it helps you to see them, you can enable debug. I believe this change will make the map more playable for next weeks ARC race. I was really afraid of people bursting between the beacons after remote detonation. Map is available on Team+ and ARC servers. I added ball_flag_table and ball_race_portal above. 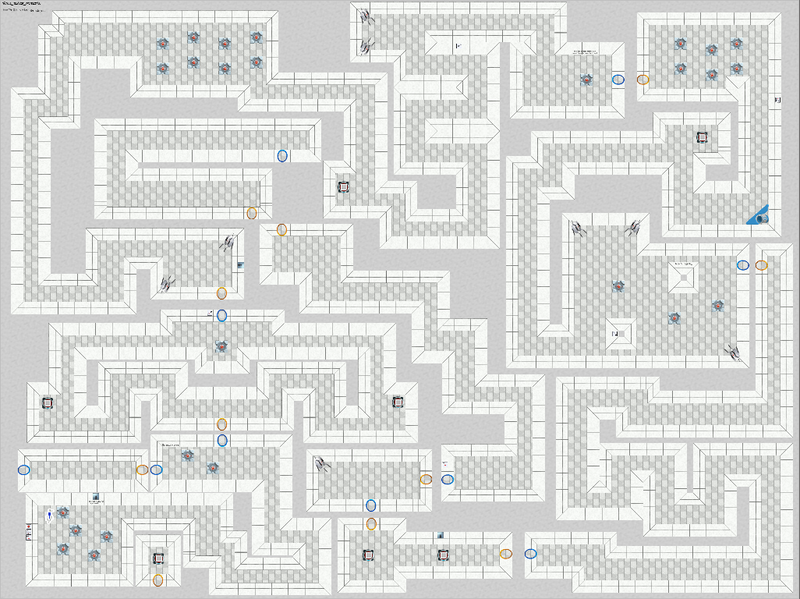 ball_flag_table is a capture-the-flag map where you have to make intelligent choices regarding the killing of turrets. ball_race_portal is a valve portal inspired race track with tight turns. Unless biell would rather do the transfer..?